Maybe greens aren’t so bad after all. I made three attempts to use greens with pasta. The first one I just added some kale to pasta with pine nuts. It wasn’t a lot of kale, and it wasn’t bad. I tore it in to pieces and blanched it for about 30 seconds. Then tossed it in with the pasta. The second try was really good. I separated out the mustard greens, blanched and chopped them. Then I heated some butter and olive with pine nuts, minced garlic and lemon zest. When the butter was sizzling, but not yet brown I added some slightly thawed frozen shrimp, the chopped greens, some Parmesan cheese, and salt and pepper. I sauteed everything for about three minutes until the shrimp was cooked and served it over pasta. Supper was enjoyed by everyone! The third try was less yummy. I tried the same thing with the rest of my mixed greens and without the shrimp. It didn’t work so well. The greens clumped up with the Parmesan and got kind of crispy. Next time I’ll add some water. Overall, though, I think are family is making peace with greens. We’re pretty proud of ourselves. Turnips, on the other hand, are still giving me fits. The Asian turnips are nice, but I can’t seem to find a good use for the regular ones. Lately, I’ve been trying different versions of roasted root vegetable recipes. But roasted turnips still taste like turnips. I’ve also tried passing them off as a substitute for mashed potatoes. That went over like a ton of bricks. So I’m on the look out for other turnip ideas. 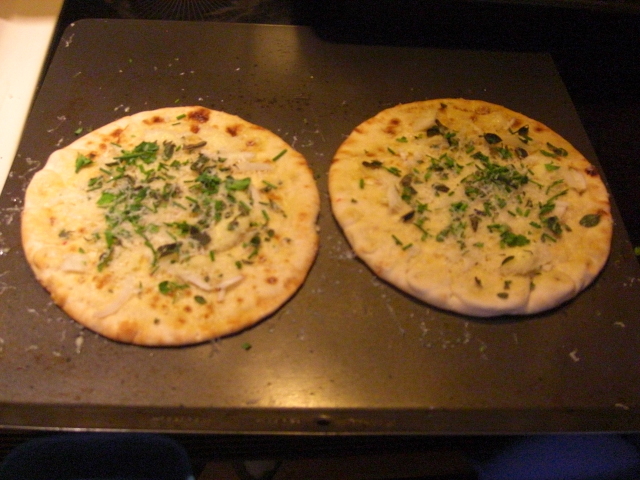 I wanted to make pita crisps with this week’s herbs, so I planned to by pita bread at the store. But I came home with flat bread instead. 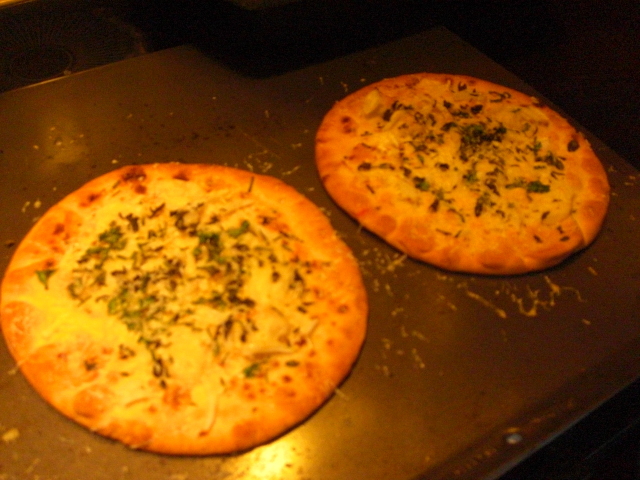 So we made white pizza instead with olive oil, garlic, fresh Italian herbs, and Parmesan. Later in the week, I pulled some pesto out of the fridge and chopped up some leftover chicken breast and made pesto chicken pizza. That was really good. We’re making progress on our bag of sweet potatoes. We still aren’t tired of fresh lettuce and baked sweet potatoes for lunch. And an apple for dessert. Mmmm… fall. Oh yeah, and we made French toast for Saturday breakfast with our eggs!